The police department's use of force with Occupy Oakland not only has prompted litigation, but could play a role in whether the agency ends up in federal receivership. 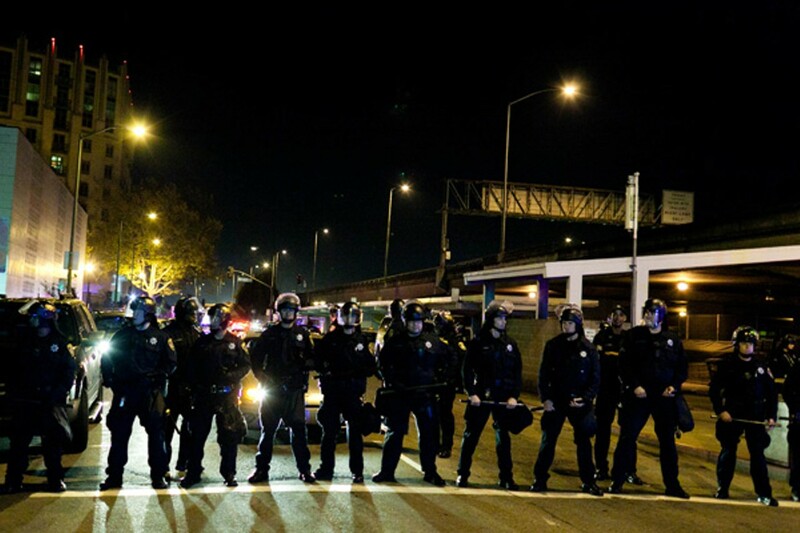 Oakland police are accused of using excessive force on October 25 and November 3. Even though the Occupy Oakland encampments are no more, the legal fallout from police use of force against demonstrators on October 25 and November 3 is just beginning. The City of Oakland is not only facing a class-action lawsuit from the American Civil Liberties Union and the National Lawyers' Guild, but police use of tear gas and less-than-lethal weaponry on Occupy Oakland demonstrators could impact a court consent decree involving the Oakland Police Department. In fact, the police response to Occupy Oakland could play a role in whether OPD ends up in federal receivership come January. The new round of legal problems facing Oakland and its police force began on the morning of October 25 when police raided the Occupy Oakland encampment at City Hall plaza and evicted the protesters. Occupy Oakland supporters reconvened later that afternoon and marched through downtown, clashing twice with police at 8th and Washington streets and a few hours later at 14th Street and Broadway, where approximately fifty police officers fired tear gas and less-than-lethal projectiles at a crowd of roughly two thousand demonstrators. During the first of five volleys of tear gas, beanbags, and pepper balls that evening, 24-year-old Marine veteran Scott Olsen was struck in the head with an unidentified projectile, sustaining a skull fracture and brain damage. At least nine other demonstrators were hospitalized that night for wounds inflicted by projectiles or from the effects of tear gas. Eight days later, tens of thousands joined in a historic general strike. A day of mostly peaceful demonstrations, save for broken windows and scuffles between members of the Black Bloc and protesters opposed to property destruction, was capped with a shutdown of the Port of Oakland. Later that evening, a group of roughly three hundred demonstrators broke into the former home of the Travelers' Aid Society, an aid group for the homeless that lost its building in foreclosure proceedings. After protesters erected barricades outside the building and lit them on fire, police ordered the crowd to disperse and then once again fired less-than-lethal projectiles and tear gas at demonstrators at 16th Street and Telegraph Avenue, as well as at a group on the north end of City Hall plaza. 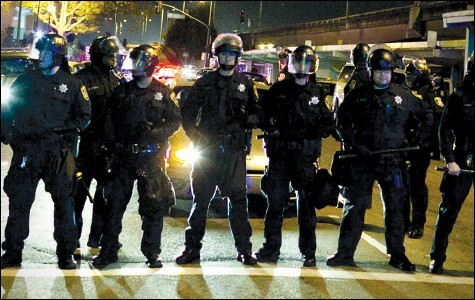 In response to those incidents, the ACLU of Northern California and the National Lawyers' Guild filed a class-action lawsuit against the city on November 14, alleging that OPD's tactics violated the department's crowd-control policy, which was rewritten in 2003 following a lawsuit and $2 million settlement over clashes between Oakland police and anti-war protesters at the port. In addition to the excessive force claim, the class-action suit asked US District Court Judge Richard Seeborg to grant either a temporary restraining order or a preliminary injunction barring OPD from using crowd-control agents at future protests until the lawsuit is resolved. Despite Seeborg's refusal last week to issue a temporary restraining order, the ACLU and the National Lawyers' Guild are still pressing their case for a preliminary injunction against OPD in advance of a November 30 hearing. On November 18, they filed a new motion for an injunction accompanied by twelve additional declarations from legal observers, bystanders, and reporters who were targeted with chemical or less-than-lethal munitions and arrested on either October 25 or November 3. "We're gravely concerned that the police responded to political protest with excessive force," said ACLU-NorCal attorney Linda Lye. Lye also said she is "gravely troubled" by the city's claim that OPD's actions did not constitute excessive force. Among the allegations documented in the suit are: firing less-than-lethal weapons indiscriminately at the crowd; firing flash-bang grenades and tear gas canisters into a crowd at unsafe distances; excessive use of tear gas and baton jabs resulting in grievous injury (as in the case of Kayvan Sabeghi); and targeting people with less-than-lethal weapons who did not pose an immediate threat. The best-known case of the latter violation is Scott Campbell, a legal observer who was struck with a shotgun-fired beanbag on the morning of November 3 while videotaping a line of police at 17th Street and San Pablo Avenue. In a court declaration, Interim Oakland Police Chief Howard Jordan contended that his officers acted appropriately because they had objects thrown at them during the October 25 morning raid, the afternoon clashes at 8th and Washington, and again at 14th and Broadway that evening. Jordan said that police made thirty announcements of unlawful assembly at 14th and Broadway. The decision to use force was made, Jordan stated, when the crowd did not disperse and "a number of persons continued to engage in violence, including vandalism and assaulting the officers" with glass bottles, rocks, and spent tear gas canisters. The use of force on November 3, Jordan contended, was necessary because demonstrators attacked police with bottles and concrete blocks. While OPD is investigating any reported incidents of people injured on either night, Jordan contended that "all operations ... have been conducted in strict accordance" with OPD's crowd-control policy. But the ACLU and the National Lawyers' Guild are also seeking to link their lawsuit to the negotiated settlement agreement overseen by US District Court Judge Thelton Henderson. The NSA is a series of reforms agreed upon nearly nine years ago as a result of the Riders police corruption case. OPD is behind on NSA-mandated changes and Judge Henderson has threatened to place the department under federal control if reforms are not complete by January 2012. Oakland City Attorney Barbara Parker filed a response to the class-action lawsuit on November 18, arguing that the NSA suit and the legal action stemming from OPD's response to the Occupy Oakland protests are unrelated. The city attorney did not return requests for comment for this story. While both the plaintiffs and the city will present their arguments to Judge Henderson, the most crucial input will come from the independent monitoring team. Headed by Robert Warshaw, the former police chief of Rochester, New York, the monitoring team is a group of court-appointed former law enforcement officers charged with auditing OPD's compliance with the NSA. Coincidentally, Warshaw and members of the monitoring team were in Oakland on unrelated business on October 25 during the first round of clashes between police and Occupy Oakland supporters. Late last month the monitoring team announced that it would independently investigate OPD's use of chemical agents and less-than-lethal projectiles to determine whether the department violated its own crowd control policies. Another motion filed by John Burris and Jim Chanin, the plaintiffs' attorneys in the NSA case, will indicate what level of control Judge Henderson will exert over OPD in relationship to the Occupy Oakland incidents. A video from November 3 showed police Officer Jim Hargreaves with black tape covering his name tag in violation of the NSA. Only when the videographer points out the tape to Lieutenant Cliff Wong did he walk over and remove the tape from Hargreaves' uniform. Burris and Chanin have asked for contempt-of-court sanctions against both Hargreaves and Wong. "The fact that this officer could do this in the presence of so many other officers indicates we haven't obtained the cultural change we wanted in this department," Chanin said. Despite the city's claims of reform, the Frazier Report details the Oakland police department's culture of impunity and failure to change.